Why is there so much rebellion against “the authorities” in the world today? Is it the fault of “insurgents,” “radicals,” “extremists” or…the authorities? Historical patterns repeat. System dynamics, the study of how underlying dynamics cause a system (e.g., a country’s political system) to behave, which I have referred to as the “second lens” for studying international relations/world politics/global affairs, has identified a set of patterns that repeat. Called “archetypes,” these patterns occur not only in history but throughout human behavior. I discussed elsewhere how “Fixes that Fail” contributes to the rise of political instability; “Shifting the Burden” offers another way to think about such failures. 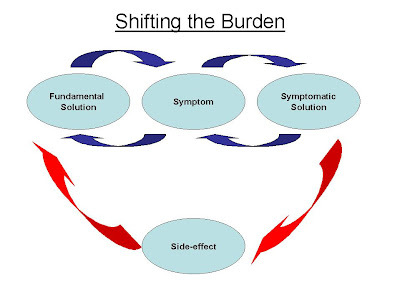 In the “Shifting the Burden” pattern, a symptomatic solution temporarily alleviates a problem, diverting attention from the fundamental solution; meanwhile, side effects of the superficial “solution” intensify the problem because the real cause is being ignored. That is, the “fundamental solution, on the left, is ignored, because the “symptomatic solution” is easier and, perhaps, seems to work at first. The ability of a symptomatic solution, i.e., one that alleviates a symptom without curing the disease, to appear successful at first, is a trap because people will assume that what worked at first should be tried even harder when it starts to fail. Understanding that one may be faced with a fix that is failing will alert you to face up to the need to address the underlying cause when papering over the symptoms starts to fail. When the fix starts to fail, look more deeply into the dynamics. When thinking about how societies deal with violence, this pattern can be critically important. The first step in the story of a violence-plagued society may be an effort by the establishment to stop extremism by the use of force rather than listening to the extremists’ complaints. Such use of force may well distract the regime and inhibit the flow of scarce resources into social welfare spending. 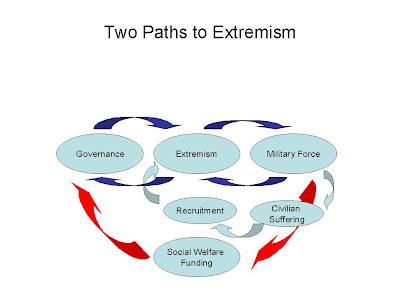 Whatever the short-term impact on extremism, over the long-term, frustrations in society over decline in the quality of governance may then well end up strengthening extremists. 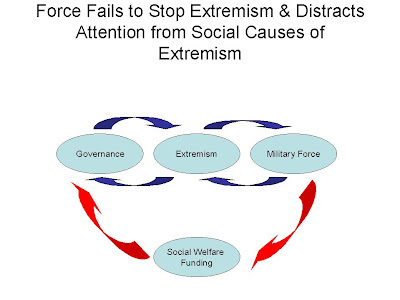 This gives the following picture, in which the military fix has failed over the long-term because it had a negative impact on social welfare spending and enhanced civilian suffering, leading to a rise in recruitment into extremist ranks. In any particular case, there may of course be any number of side effects instead of or in addition to constraints on social welfare spending. The point is to avoid the trap of being tempted to take aspirin to relieve a headache caused by a brain tumor.